As a girl in Mexico City and a boy in New York City ponder moving to each other’s locale, it becomes clear that the two cities — and the two children — are more alike than they might think. But I’m not sure I want to leave my home. I’m going to miss so much. Moving to a new city can be exciting. But what if your new home isn’t anything like your old home? Will you make friends? What will you eat? Where will you play? In a cleverly combined voice — accompanied by wonderfully detailed illustrations depicting parallel urban scenes — a young boy conveys his fears about moving from New York City to Mexico City while, at the same time, a young girl expresses trepidation about leaving Mexico City to move to New York City. 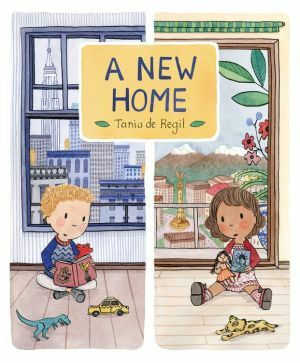 Tania de Regil offers a heartwarming story that reminds us that home may be found wherever life leads. Fascinating details about each city are featured at the end.